Award-winning faculty will prepare you for success. Global perspective will give you tools to succeed throughout the financial world. The Online Master of Science in Finance (MSF) turns today’s best financial professionals into tomorrow’s most influential leaders. Georgetown University’s online MSF exemplifies nearly 230 years of higher learning excellence; combining a cutting-edge virtual platform with a legacy of brilliant, ethically driven education. Whether you’re a working professional, or a recent undergraduate, our program will prepare you for the next step in your career. Choose the full-time or part-time track, online or on campus, whichever works best for you. Comfortably interact with accomplished professors and like-minded peers through synchronous, online classroom, video, and chat sessions. Actively participate in discussions and learning activities via our cohort model where students learn collaboratively while building lifelong career connections & friendships. Learn to apply real-world solutions to global financial challenges in a rigorous, world-class curriculum. Propel your leadership pursuit with access to Georgetown’s Professional Career Services. Though no program can guarantee you a job after graduation, our MSF students have received job offers from some of the most prestigious firms in the world including: Bank of America, Merrill Lynch, Booz Allen Hamilton, Boston Consulting Group, Deloitte LLP, Goldman Sachs Wealth Management, J.P. Morgan, Chase & Co., KPMG, McKinsey & Company, and UBS. At Georgetown University, we are proud to serve members of the U.S. Military, and are currently ranked 5th in 'Best Colleges for Veterans' by U.S. News & World Report. We proudly participate in the Yellow Ribbon Program, offer an application fee waiver to our military students, are a designated Military Friendly® School, and offer merit-based scholarships. Complete 32-36 credits within 21 months. The online MSF program consists of six core courses — Financial Markets, Financial Accounting, Corporate Finance, Financial Econometrics, Advanced Corporate Valuation and Modeling, and Principled Financial Leadership; a week-long opening residency in Washington D.C.; a Global Consulting Project; and four to six elective courses. To get your program report and learn more about the online MSF and Scholarship Opportunities, complete the form below and a program manager will contact you. Please register me for the MSF Information Session on 5/14 at 7 PM ET. 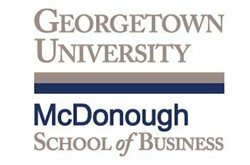 The McDonough School of Business is widely regarded as one of the world’s leading business schools. Its finance program consists of a vibrant community of award-winning scholars, teachers and policy-makers, many of whom have excelled in some of the world’s leading financial firms. ©@@CurrentYear Georgetown University. All rights reserved.